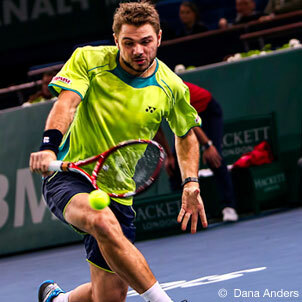 Get the latest men’s singles and doubles tennis rankings for the ATP world tour. Have you ever wondered how the latest men’s tennis rankings are calculated? If so, you’re not alone. At first glance the ATP ranking system can come off a bit daunting, especially when compared to other sports, but the good news is that it’s really not all that bad. At TennisCompanion we think all tennis players and fans should have at least a basic understanding of how men’s tennis rankings are calculated. As a result, we’ve spent some time to put together this section to explain how it works. To start, men’s tennis rankings are based on a simple point system. In other words, the more points a player accumulates the higher their ranking. Each player accumulates points through the participation in various tennis tournaments throughout the year and the further a player progresses through a tournament the more points they are rewarded. Of course, as you can imagine the distribution of points varies depending on the tournament. For example, winning the US Open is going to be worth more points than winning a small Challenger Tour tournament. With that said, let’s take a quick look at the types of tournaments that make up the men’s professional tennis circuit. Tier 1 tournaments are typically the most familiar or well known group of men’s professional tennis tournaments. These include the Grand Slams, ATP World Tour Masters 1000 as well as the ATP World Tour 500 & 250 tournaments. Each year, the men’s ATP runs four grand slams. Things kick off in the beginning of the calendar year with the Australian Open, then we move on to the French Open, Wimbledon and we wrap things up with the US Open at the end of the summer. While not as high profile as the four grand slams, the nine annual masters tournaments run throughout the year in North America, Europe and Asia. These tournaments include the famous Monte-Carlo Rolex Masters as well as the BNP Paribas Open in Indian Wells, CA. The third tier and fourth level of tier 1 men’s ATP professional tennis tournaments include ATP World Tour 500 & 250 tournaments. The 500 series includes 11 annual tournaments, while the newer (established in 2009) 250 series includes 40 tournaments throughout the year. The men’s Challenge Tour is a step down from the ATP World tour and the ability to earn ATP points is limited in comparison to the World Tour. As a result, you won’t see many top 100 players competing frequently in these tournaments. The following Challenger Tour tournaments are held each year. The lowest and final tier of men’s professional tennis tournaments are the Futures. While these tournaments don’t award many points, they are the stomping ground for amateur players looking to make their mark and earn points to make their way into Challenger Tournaments and finally the ATP World Tour. So… what does all this mean? As you may have guessed the number of points tied to a specific tournament depends on the tier. The higher the tier, laddering up from the Futures all the way to the Grand Slams, the more points a player has the opportunity to accumulate. We find one of the easiest way to get a grasp for how points are awarded to players at each level of tournament is by looking at a table that breaks down the point distribution. In the table below you’ll find the current men’s ATP point distribution. On the left hand side, all of the tournaments are listed and across the top you’ll notice abbreviations for the different rounds of the tournament, which match up with the number of points that are rewarded. How can I learn more about ATP World Tour rankings?